The beef for these tacos literally falls apart, it is irresistible. 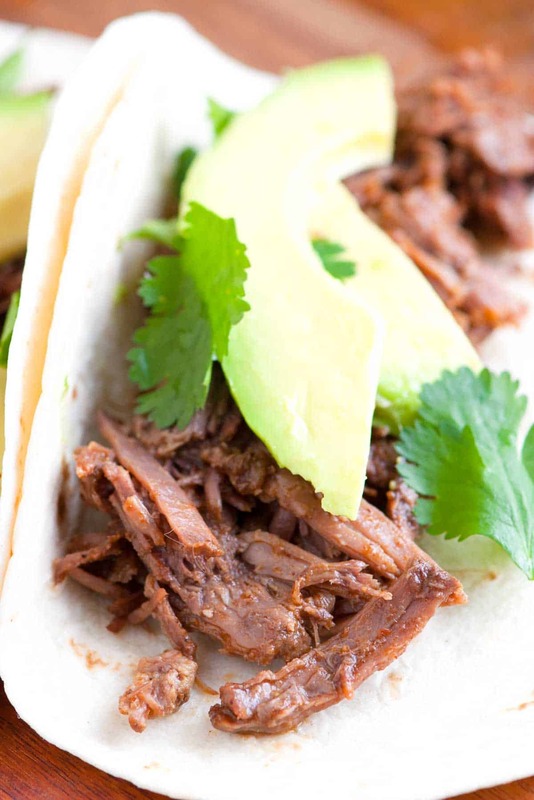 Jump to the Shredded Beef Tacos Recipe or read on to see our tips for making them. The shredded beef is savory, rich, and delicious. We cook them low and slow with garlic and spices until it falls apart. YOU MAY ALSO LIKE: Meet your new favorite shrimp taco recipe. There’s chile butter shrimp, mashed avocado and a quick and crunchy slaw. 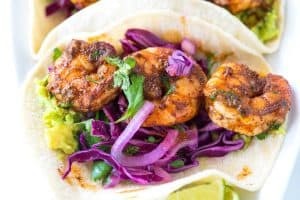 Jump to the Chile Butter Shrimp Tacos Recipe. 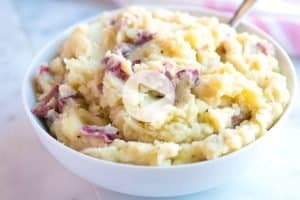 We use our oven for this, but you can just as easily use a slow cooker. 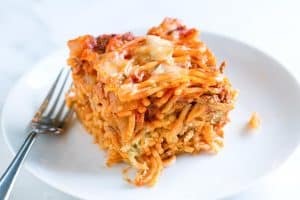 Check the notes section in the recipe below for our tips. 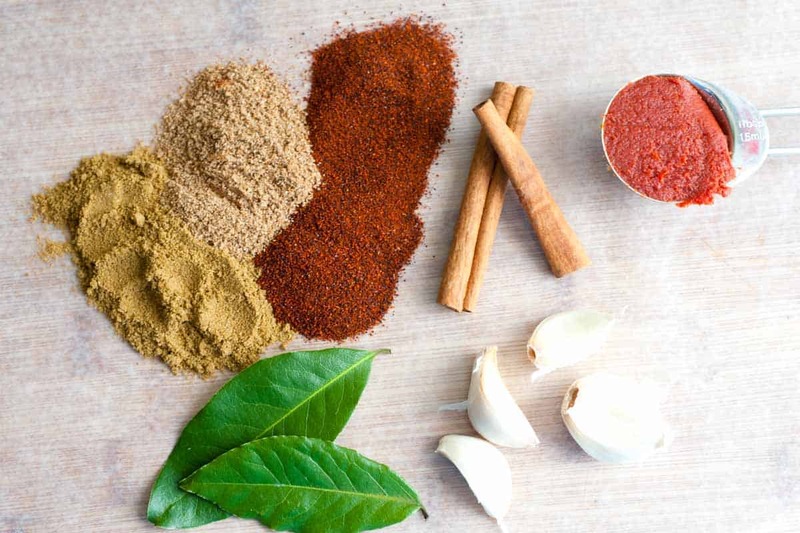 We add lots of flavor to the beef — garlic, tomato paste, chili powder, cumin, coriander, bay leaves, and cinnamon. For the beef, we use chuck, but keep in mind that this recipe will also work with pork shoulder and lamb shoulder. It’s important to season generously with salt and pepper then sear it in a hot pan. You’re not looking to cook it all the way through — you only want to add a nice brown crust. 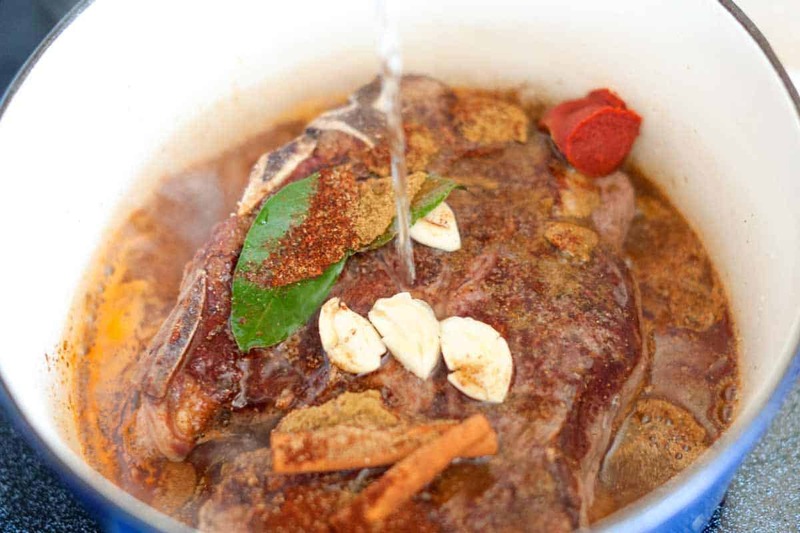 Add the spices as well as some liquid — water, stock, wine or even beer work. Then we cover the pot and slide it into a 275 degree oven for 2 1/2 to 3 hours, or until the beef falls apart when you pull at it. Once cooked, you can remove the beef from the cooking liquid and shred it. The cooking liquid is delicious so we like to strain it, remove excess fat and then reduce it by half. When you are reducing the liquid, give it a taste and see if it need salt or pepper. 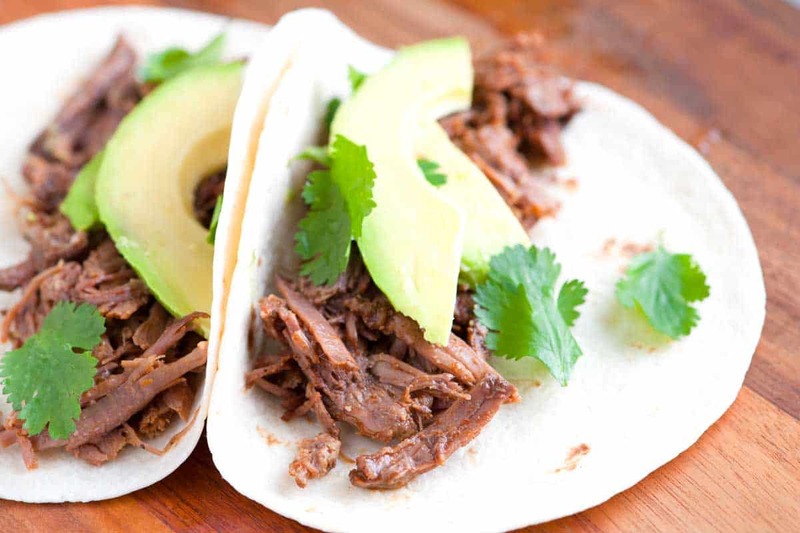 When it is reduced, pour it over the shredded beef and serve next to tortillas and your favorite taco toppings. YOU MAY ALSO LIKE: How to make the best Guacamole every time. 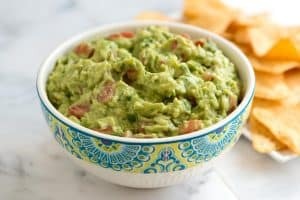 Jump to the Guacamole Recipeand watch our quick recipe video showing you how to make it. 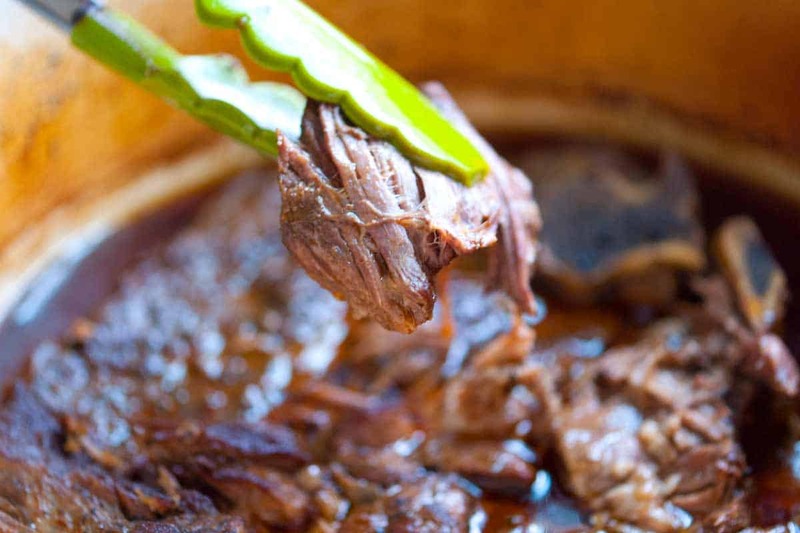 The secret to the best shredded beef is to cook it low and slow. 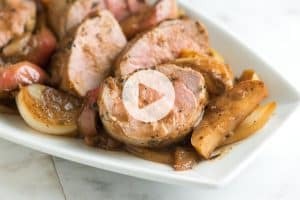 We use our oven for this, but you can just as easily use a slow cooker. Check the notes section in the recipe below for our tips. Heat oven to 275 degrees F and heat a large dutch oven over medium-high heat. Generously season both sides of the beef with salt and pepper. Add oil to hot pot. Add beef and cook, turning occasionally, until beef is well browned on all sides, about 8 minutes. Add garlic, tomato paste, and the spices to the pot. Then, add the water so it comes up about three-quarters of the way up the side of the beef. Stir then cover with lid and cook until the meat is very tender, 2 1/2 to 3 hours. 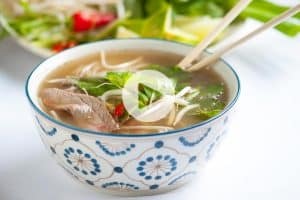 Transfer the meat to a bowl, and let it cool, then shred it with a fork. Strain the cooking liquid and skim off the fat that has collected at the surface. Place the liquid back into the pot and bring to a simmer over medium-high heat. Cook until reduced by about half. Taste the liquid and adjust with more salt or pepper. 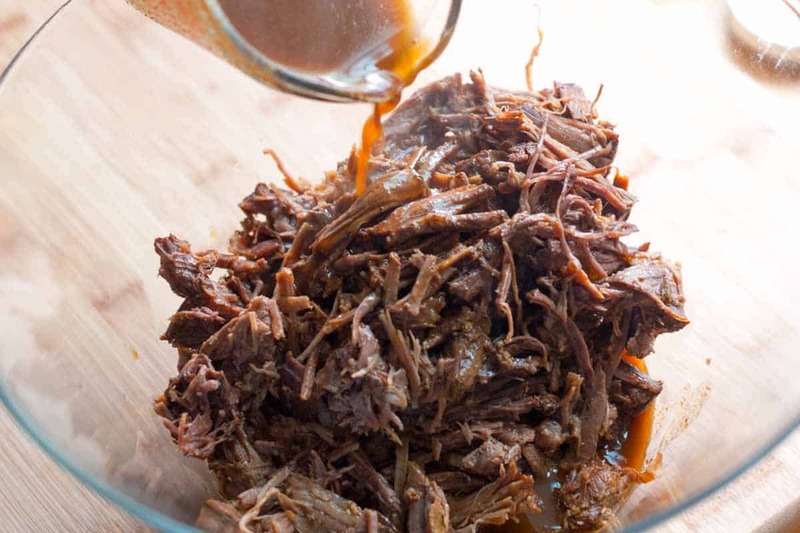 Pour liquid over the shredded beef. Serve with tortillas and taco toppings. To make this in the slow cooker, follow the steps through searing the beef then add the beef, tomato paste, spices, and water to a slow cooker. Cook on HIGH for about 4 hours or on LOW for 6 to 8 hours. Then shred the meat and follow our instructions for the cooking liquid shared above. Nutrition facts: The nutrition facts provided below are estimates. We have used the USDA Supertracker recipe calculator to calculate approximate values. We have omitted salt since you will need to add to your tastes. We assumed 10 servings and did not include tortillas or toppings. It Was awesome easy to make! The salsa verde enchiladas can definitely be made with beef. FIVE stars! It came out like authentic Birria. I made this for a potluck at work and received a lot of compliments on it! I made it in the crockpot. it cooked on high for 2-3 hours then reduced to low and left for 5-6 hours more. Beef was shred tender. I added dried ancho chile (remove stem and seeds and soak two chiles in boiling water and purée in blender) and a little extra tomato paste too. After reducing the cooking liquid it tasted really salty on its own but it was fine once added to the meat. I only added a scant teaspoon salt to the broth at the beginning of cooking. Tried this yesterday. Definitely the best shredded beef tacos I have ever made. My wife came home and said “what is that heavenly smell”? after the pot had been in the oven all afternoon. Mine was fork tender in 3 hours. Thank you. Can you use ground cinnamon for the sticks? Hi John, Yes – You can use ground cinnamon — try 1/4 teaspoon per stick. So, in this recipe, you’ll want to add 1/2 teaspoon of ground cinnamon.